So here we sit brainstorming in the morning over coffee, around how we are going to maximize the potential revenue obtained through promoted Tweets. As interesting as that is by itself … why am I sharing this with you? Because we are going to use our own product, Affiliates Enterprise, to analyze the effects of those promoted Tweets that shall help to sell more of it. In other words, this article is about how we use Affiliates Enterprise to obtain important insights, on the usefulness (or not) of the marketing efforts we undertake to grow its customer base. Following Guy Kawasaki’s advice on telling stories that are effective , it’s about how we use our product for our own purposes. By the way, it doesn’t matter if you are running an affiliate program or not, you can simply use the tool to track your own campaigns as shown here. We would like to use this tool to track the actual performance of the ads – promoted Tweets – and we will set up several campaigns for that. This method applies to any kind of social media advertising, to affiliate marketing and growth hacking strategies alike. It’s so obvious, with traditional marketing, companies put lots of $ into advertising campaigns and many blindly hope for the best. Let’s spend a really large sum on Google and Twitter ads and see how it goes? I don’t think so. We want to know how much traffic and how many sales our campaign is producing. Not only that, we want to know where that happens. And we want to know if it’s worth it, compared to other methods. Later in this post, I am going to suggest a free alternative whose performance you can also track using the method explained here. We need to know if it works! One of the things we’d like to find out is in which country our ROI is the highest. Based on the assumption that there are potential clients in many countries, we would like to concentrate our promoted Tweets on those countries where the conversion rate (clicks ending up in sales) is the highest. Correct me if I’m wrong, but there’s no simple way – without coding – we could make Twitter identify the campaign or country that produces a sale for us. I don’t think that it’s even possible to have Twitter add a parameter identifying the country of someone who clicks a link in a promoted Tweet, nor is there a method in their API that would provide this information. Even if it were possible, we would still have to process that information in some way and link it to sales. We would have to use their API and spend a lot of time coding and testing, time I think is better spent at improving our products, to make them more useful for you (and us). If we add a link to a promoted Tweet, we can use our own URL parameters, like identifying an affiliate or a specific campaign, but we won’t be able to trace how many clicks from the US for example have actually generated sales. Simply put, we won’t know anything about sales that come through promoted Tweets by country or campaign … but that’s exactly what we want to know! What now? Although we can’t distinguish between targeted countries within the same campaign, we can set up several campaigns that each target a different country, and using Affiliates Enterprise, we can use a dedicated campaign ID for each of those. Let’s assume we are going to run three different test campaigns, one for the US, another for the UK and a third one for Canada. Each Twitter campaign will promote essentially the same Tweet, linking to the same page on our site, the only difference is that we will have a different campaign ID in each link. Thus we will be able to distinguish incoming visitors by campaign and we will gain valuable insights – as we know how many visitors come through our US campaign, how many through our campaign in the UK and those that come through our dedicated campaign in Canada. Not only will we know about how many visitors, we will know the exact share of the sales volume each campaign produces. Based on that, we will be able to compute the ROI for each campaign and focus our efforts on the most profitable region. The same strategy can be used to fine-tune campaigns by measuring their performance against each other. Instead of spending money blindly on ads, we will be able to measure their impact on sales. With that, we can decide to continue the ads or not, choose those that are most suitable and try others to find out what helps best to grow our sales volume. This is how we set up different campaigns in Affiliates Enterprise to obtain performance stats for each. First we create a new affiliate named Twitter and set its referral rate to 0 (zero) – we don’t want any amounts credited to this affiliate account, when referrals are recorded for sales that comes through one of the related campaigns. Now we create three new campaigns for this affiliate and name them accordingly, so they are easy to distinguish and search for in the Campaigns section. For example, we will name them Twitter US, Twitter UK and Twitter Canada. You will get something similar to what’s shown in the screenshot below. Although the URLs shown in this screenshot are not the ones we actually use in our real campaigns, you can see there is an affiliate ID and a campaign ID related to each. As we have just created the campaigns and nobody has visited the URLs yet, all stats on Hits, Visits and Referrals are zero and the Totals are empty. That’s going to change once the corresponding Twitter campaigns are running. We can use the campaign URLs directly or we can link to any page on our site by appending the ?affiliates=123&cmid=456 part for the first campaign, and the according parameters with the cmid value changed for the other two. Next we set up the three campaigns for promoted Tweets on Twitter. 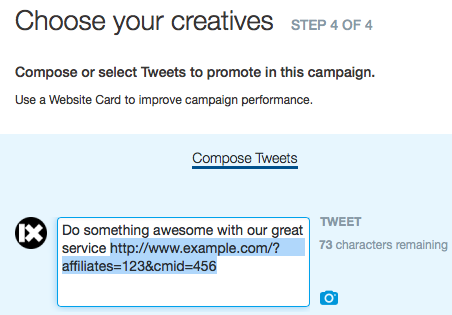 You can set up one campaign and then copy it and alter only the locations and the content of the promoted tweets. 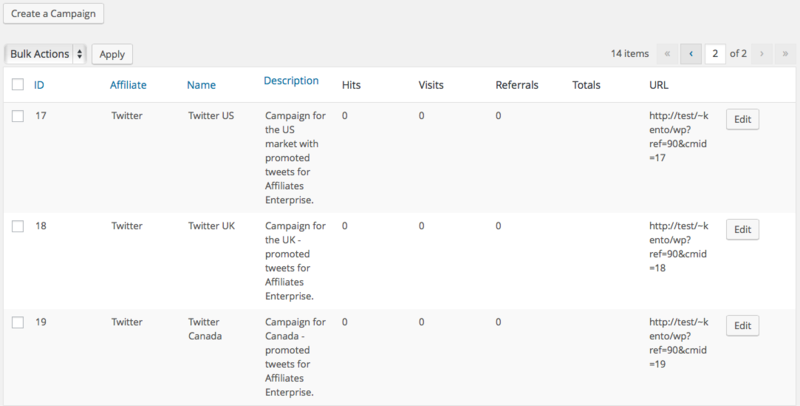 For example, we create one Twitter campaign specifically for the US by choosing United States in the Audience Profile. Now let’s compose a Tweet that is using the URL for the Twitter US campaign we have created in Affiliates Enterprise. 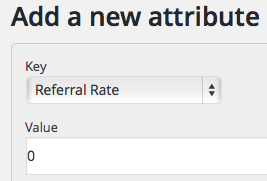 When your campaign is running, clicks on that link will be reflected in the campaign statistics shown in Affiliates Enterprise. You will also see how many visitors this has brought to your site and how many sales. As this Twitter campaign is directed only at users located in the United States, we now have the solution to knowing the impact of this campaign for a specific country. After settings up this first campaign, we can simply copy it to create two additional ones for the UK and Canada, each with its own promoted Tweet using the same wording but the specific URL as indicated for each campaign in Affiliates Enterprise. Earlier in this post, I promised to suggest a free method that you can use to promote your product or service. 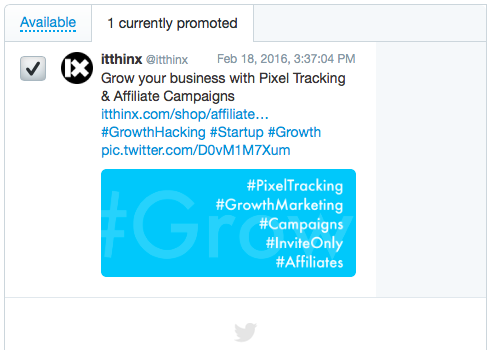 As with the promoted Tweets linked to a campaign, you can link to any post on your site. Just as we have created a virtual affiliate for our Twitter campaigns, you can create a virtual affiliate for organic traffic and create one or more campaigns related to it. You can write useful content for your customers and promote it through social media – publish Tweets that link to your valuable content, post linked summaries on Facebook, LinkedIn, Reddit, etc. using a URL to your post that identifies the organic affiliate and the corresponding campaign. If you would like to take a closer look at our tool, head over to the Affiliates Enterprise product page or see details on its Documentation pages. It will be quite interesting to take a look at the stats in a while and I plan on posting a follow-up article with insights we gained shortly, but feel free to ask any questions or suggest improvements on this approach by posting your comment here. Great post awesome tips, just love the mentioned points by you. Good, concise review, Kento. People are much more likely to read something of this length.